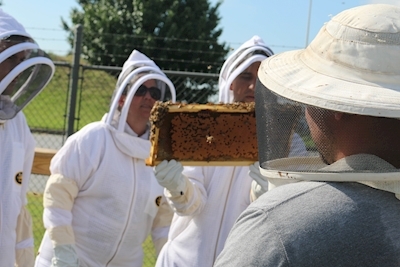 To celebrate, Nicholas Weaver, Delta’s dedicated beekeeper from Bee Downtown, and members of the airline’s Corporate Safety, Security & Compliance division, team took a tour of Delta’s bee yard — affectionately known as the “Honey Hangar” — to get a lesson in beekeeping while assessing the hives’ health and honey production. “Delta’s bees are doing really well at foraging,” Nicholas said. “The Delta bee yard is the only bee yard of Bee Downtown partners in Atlanta that hasn’t needed to be fed sugar water so far.” Beekeepers will supply sugar water to supplement a lack of nectar for hives that aren’t able to find enough of the essential nutrient within their 3-mile foraging radius. Since they were installed in April, the hives have produced a healthy amount of honey, but not enough for harvesting this year. “We need to make sure that the bees have enough honey left in the hive to sustain their colony through the winter months,” Nicholas explained. ​One attendee asked if harvesting the honey harms the bees and Nicholas replied, “No. A healthy colony produces an excess of honey of about five gallons, which is what beekeepers take.” He also shared that one of the more sustainable ways to harvest is to use a honey extractor, which spins the frames forcing the honey out of the wax cells using centrifugal force. This method keeps the structure of the wax honeycomb intact for reuse, allowing the bees to conserve the approximate 8.4 pounds of honey they must consume to produce just one pound of wax. 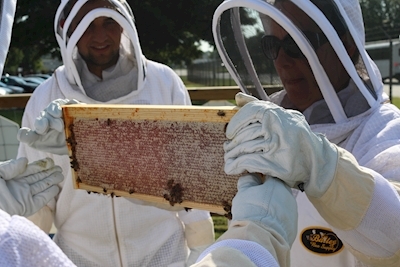 The tour ended with a p​​ositive health report highlighting that Delta’s hives have very low levels of Varroa mites. “Varroa mites are one of the leading causes of the declining bee population,” Nicholas said. This is welcome news as Bee Downtown’s mission is to slow the bee population decline with the help of companies like Delta, Chick-fil-a and The Home Depot who have stepped up to sponsor bee hives at their headquarters. Delta was the first Atlanta company — and first U.S. airline — to host honey bee hives built and supported by Bee Downtown. 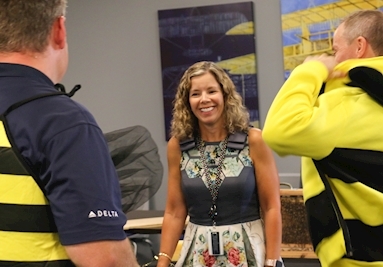 The group ended the tour by swapping their beekeeper suits for bee-themed costumes to celebrate National Honey Month with Delta leader, Christine Boucher, Managing Director — Global Environment, Sustainability and Compliance. Stay tuned to Delta News Hub for more updates as well as @DeltaNewsHub and @BeeDowntown on Twitter. 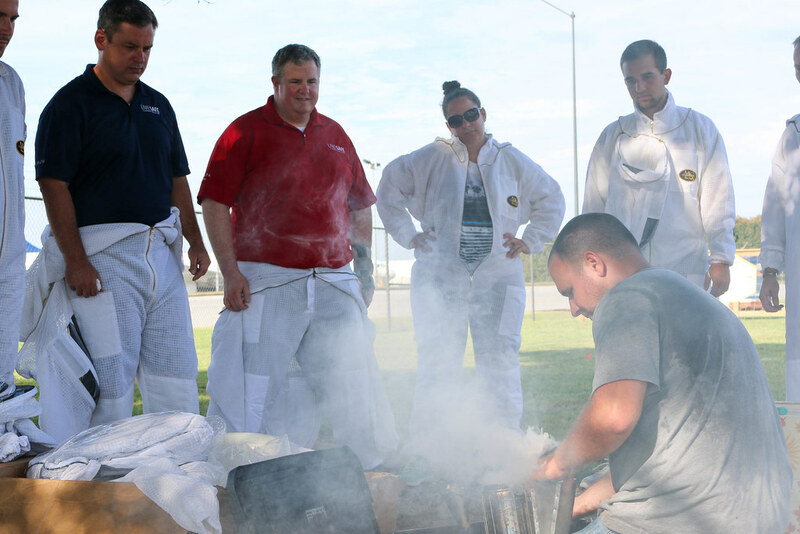 To learn more about Delta’s corporate sustainability initiatives visit the Environment page on news.delta.com.